Al Qaeda Leader Osama Bin Laden Killed, US President Barack Obama confirms the terrorist has been killed in an American-led ground operation in Pakistan. "Today, at my direction, the United States launched a targeted operation against that compound in Abbottabad, Pakistan," Obama said. "A small team of Americans carried out the operation with extraordinary courage and capability. No Americans were harmed. They took care to avoid civilian casualties. 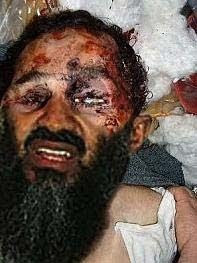 After a firefight, they killed Osama bin Laden and took custody of his body." In the latest pictures from Abbotabad, a town less than 40 miles from the Pakistani capital Islamabad, flames are seen rising from a building that was the apparent target of the raid. It is thought Bin Laden had been living in a walled $1m villa in the town for at least the last eight months. He was reportedly asked to surrender by US forces before he was shot in the head. According to an American official, Bin Laden's body has now been buried at sea. "As we have stated repeatedly since the 9/11 terror attacks, bin Laden never represented Muslims or Islam. In fact, in addition to the killing of thousands of Americans, he and al Qaeda caused the deaths of countless Muslims worldwide," the statement said. it is not fake, it is pathetically fake!!! look at the airbrush used on the right of his beard!